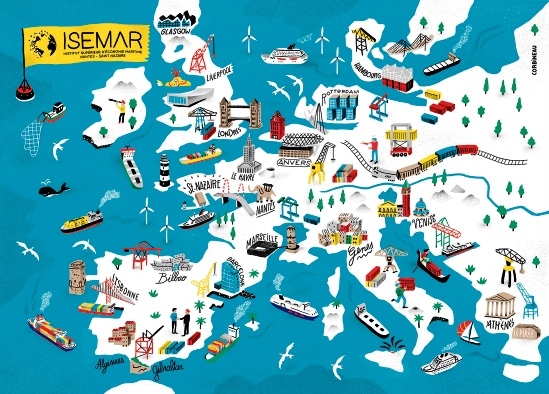 The Higher Institute of Maritime Economics (ISEMAR) was founded in 1997 by the local communities, the Chamber of Commerce and Industry and the port community in Nantes Saint-Nazaire. Its goal is to develop an expertise serving as a touchstone for maritime transport, ports and naval industry. The Institute is, therefore, a honed observatory on changes in maritime economics. ISEMAR puts its knowledge in research and understanding of maritime transport and commerce at the disposal of a wide audience since these are crucial issues in this global economic era. Since its inception, ISEMAR has published a monthly Summary Report addressing economic challenges in maritime transport. These reports cover a variety of areas related to maritime and port economics. They also monitor developments in regulations governing offshore human activities. The rigor, clarity, and independence of these reports make them benchmark documents. They are free of charge and downloadable via our website. To validate its analysis, ISEMAR has included a map as a complement to some of its reports. These act as supports offering an opportunity to see and understand the maritime world from a geographical perspective. Among other things, these maps depict maritime routes, port traffic, as well as, numerous statistics. For 20 years, ISEMAR has been a keen observer of maritime transport, ports, and naval industries. Our institute has developed an economic analysis expertise, which now serves as a benchmark. This analysis involves studies and operations in public and professional circles, editorial collaborations and training courses. We provide our partners with a broad range of assistance and support to understand current maritime challenges. We have an extensive knowledge of the markets, businesses, ports, public policies and regulatory trends. ISEMAR expertise’s high-quality support is now broadly recognized. We enjoy the trust of port authorities, private firms, professional associations as well as of local and central public authorities.